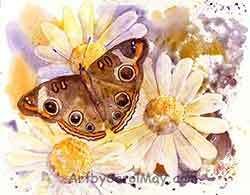 The best thing about gardening is seeing all the flowers for a daisy painting or any type of flowers you may want to paint. 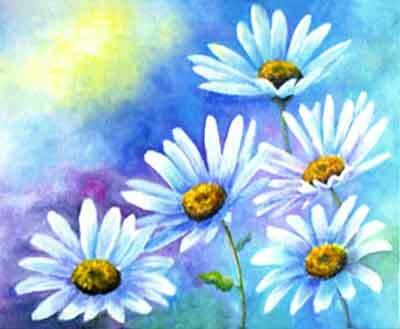 Today we are going to paint daisies. They are easy to draw and fun to paint. Daisies come in a variety of bright cheerful colors. Here are some tips to speed you on your painting journey. 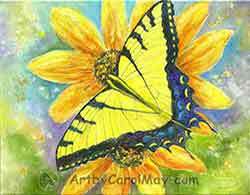 You may want to add a butterfly or a bee to give your painting added interest. 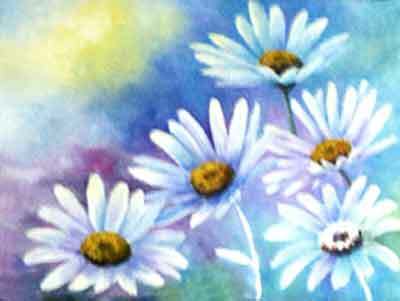 Today we will paint five white daisies. However many you want to paint is fine. But, odd numbers make the viewers feel more comfortable. 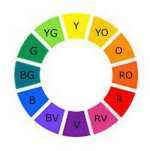 what do you need for your painting? As an Amazon Associate I earn from qualifying purchases. There is no additional cost to you. 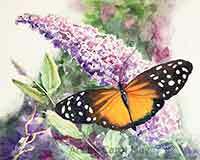 You may do the painting with oil paint, water mixable oils or even acrylics. This painting is done with alkyd paints using a disposable paper palette. The painting is on a 11x14 gallery-wrapped canvas. 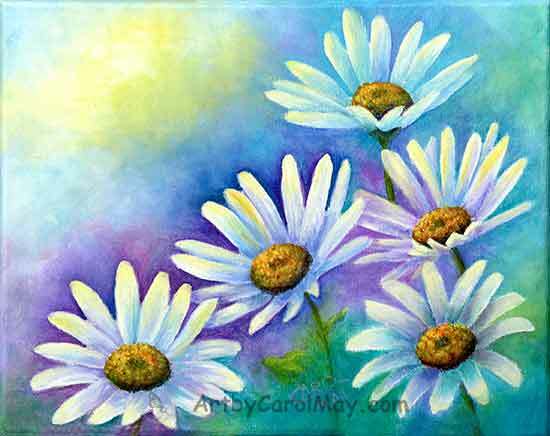 Sketch the daisies on the canvas with an ordinary graphite pencil or thinned yellow paint. 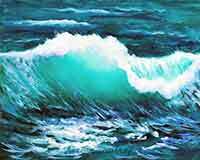 Check here for a complete list of oil painting supplies. Start with the background colors around the flowers. Use Thalo Blue or Ultramarine Blue and Permanent Rose to mix the purple background. There will be warm yellow in the flower petals. So purple (the compliment of yellow) in the background will make the flowers stand out and come forward. Use a variation of colors in the background to add more interest. Use some of the background color (either blue or purple) at the base of each petal where it attaches to the flower center. Then mix some white with the same background color for the middle section of each petal. Mix white with just a bit of yellow. Paint it on the ends of the petals and pull it back into the middle petal color. Softly blend the yellow tinted paint into the middle section of paint, so there is no definite line of color change. 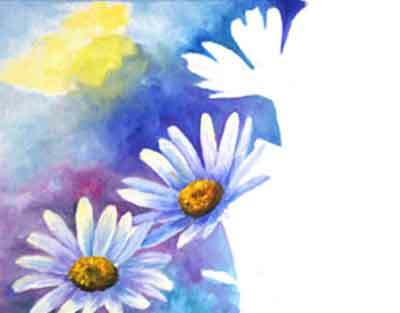 As you move up to the center of the daisy painting, make the background darker by adding darker blue or purple (whichever you desire). 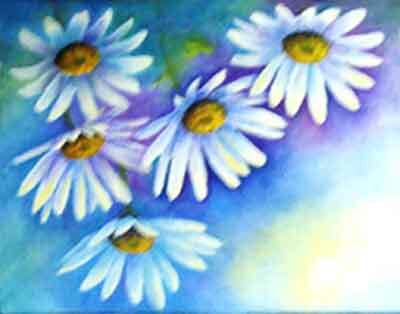 This gives high contrast for the center daisy to draw the eye into the painting. 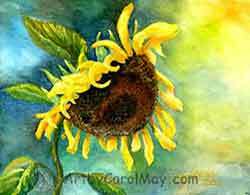 Make the background lighter out by the top, left of the canvas by adding some yellow to indicate sunlight. Up by the top daisy on the right, make the background somewhat lighter. 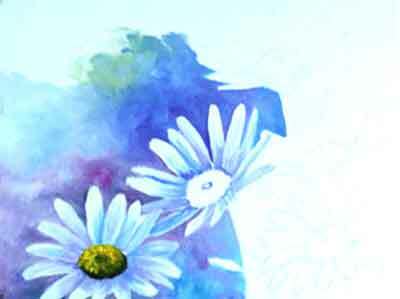 Continue painting the background around each daisy. Put a darker color on the bottom edge of each center button. Mix the dark with Thalo Blue, Permanent Rose and Burnt Sienna. The dark color on the bottom helps give contour and form to the button. Use burnt sienna higher up on the center of the button. Put yellow on the top side towards the light. 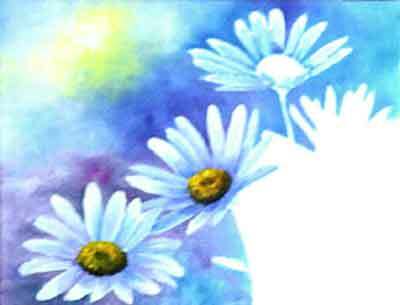 When painting these light-colored flowers, it works best to do the background first. Then paint the white petals out over the background. If the flowers are painted before the background, you are taking a chance of pulling the white off of the petals into the dark background. It makes sense doesn't it? Oil painting is done from dark to light, the reverse of watercolor. Notice the bottom left flower overlaps the center flower to set it farther back into the painting. Continue with each daisy, painting the background around it before you paint the daisy. Then use the corresponding background color at the base of each petal where it attaches to the center button. Paint the button after the petals are painted. Add the shadow on the underside of the button and the highlights of yellow and orange towards the light. Suggest some stems and leaves. Don't paint them too dark and draw the eye away from the flowers. Sometimes it helps to look at the painting upside down. It gives you a fresh look at the composition and values and color movement. I decided to make the lower right corner and the center bottom darker to help ground the painting and keep it from floating. I also lighted the purple and blue background above the two left flowers to soften the painting a bit. What a delightful daisy painting! 1. 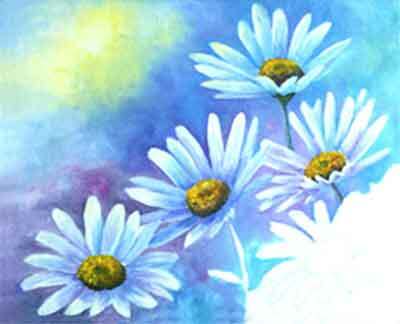 Assemble your materials and sketch the daisies on the canvas. 2. Paint the dark background before the white flowers. 3. 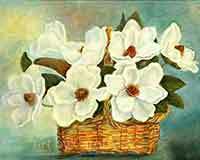 Paint the petals with the background colors in the shadowed areas and highlight the sun-kissed areas with a warm white. 4. Paint the center buttons from dark to light to show their contour. 5. Paint some leaves and stems if you desire. You Can Do It! - ENJOY!